The Festival has is now in its ninth year and each year it improves to give visitors a wondering two full days of entertainment. Porthleven Holiday Cottages, and its parent company Porthleven Harbour & Dock Company, is a major sponsor of the event which is staged around the harbour and on the adjacent playing field. Here is a round up of what you can expect from the ‘Under the Sea’ themed 2017 festival. 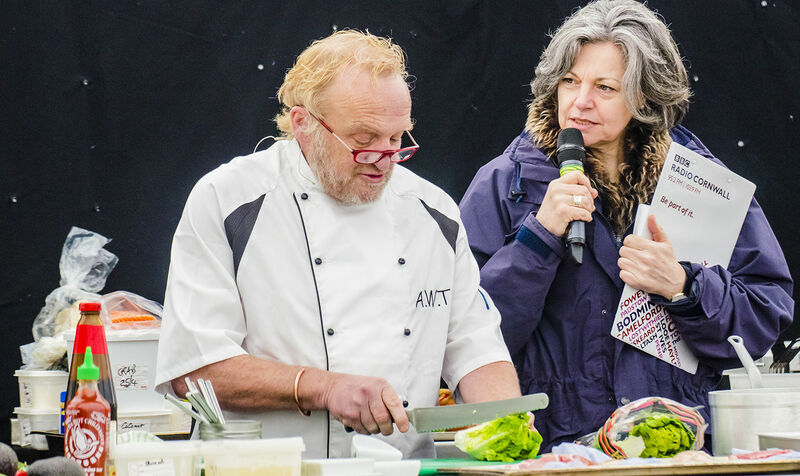 In the Shipyard Tent, Antony Worrall Thompson and Jude Kareama kick off proceedings at 10am on Saturday with their popular Ready Steady Cook chefs demonstration. Compared by Daphne Skinnard from BBC Radio Cornwall, they are followed by some of the South West’s best including Rick Stein, Josh Eggleton and Simon Hulstone. On Sunday you can come back to the Shipyard for more demos from Mullion Cove Hotel and Amelie’s restaurant along with the annual Bake Off competition. Expect plenty of sweet treats! Park yourself outside the Lime Kiln stage and watch bands all day! Or amble around the festival and listen to talented buskers at the Festival Busk Stops. The After Dark Parties on Friday, Saturday and Sunday night provide evening entertainment with headline acts. Enjoy stories, words and film plus live acoustic music. The artisan beer bar is also located here. A fine way to spend the day! Don’t miss Harbottle & Jonas at 2.15pm and Jane Darke at 3pm. Take the whole family along to the Family Field to learn circus skills and watch a trapeze, do some crafting and be entertained all day!